The communication port used for this URL is usually not used for network browsing. For security reasons, Firefox has canceled the online request. 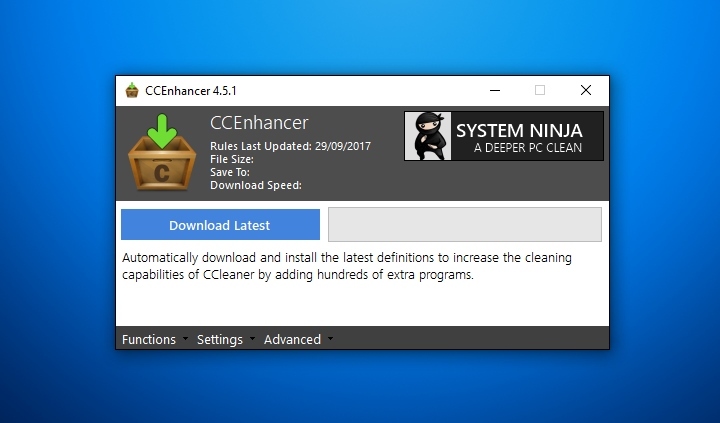 CCEnhancer 是 SingularLabs 所開發的小工具，是 CCleaner 的第三方「外掛增強包」(非 CCleaner 的 Piriform 公司所設計的軟體)，可讓官方版 CCleaner 變得更精明，硬生生增加最多 上仟種以上的新清理規則，幫您徹徹底底地將作業系統打掃乾淨。而這些新的規則都是來自 CCleaner 原開發公司 Piriform 的討論區，安全性方面是沒有太大問題的；當然，非官方外掛也會帶來一定的風險，使用者自行考量! !